This is our reference NY-16904. 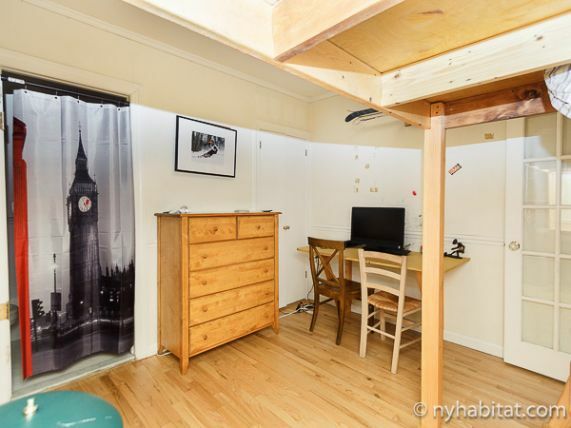 Welcome to the Upper West Side of Manhattan from this fully furnished room for rent with private bathroom located on West 97th Street and Riverside Drive. 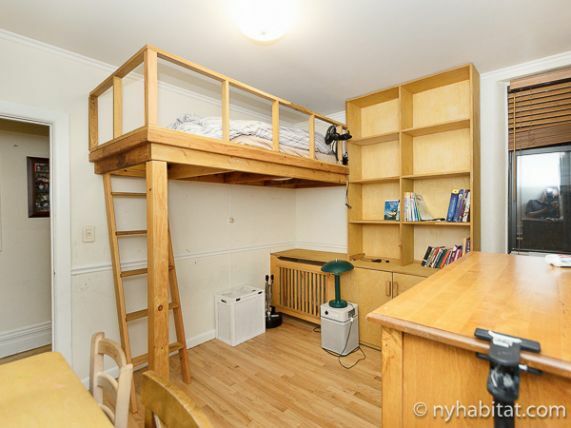 This private room for rent is situated in a shared three bedroom apartment, located on the fourth floor (third floor for Europeans) of a low-rise elevator building with laundry access. 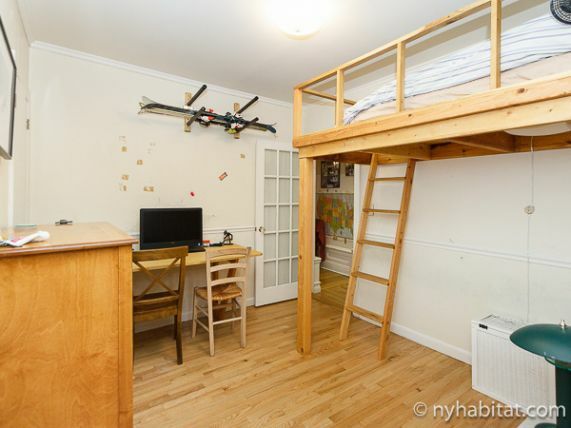 Please note that this is a private room for rent located in a shared apartment. 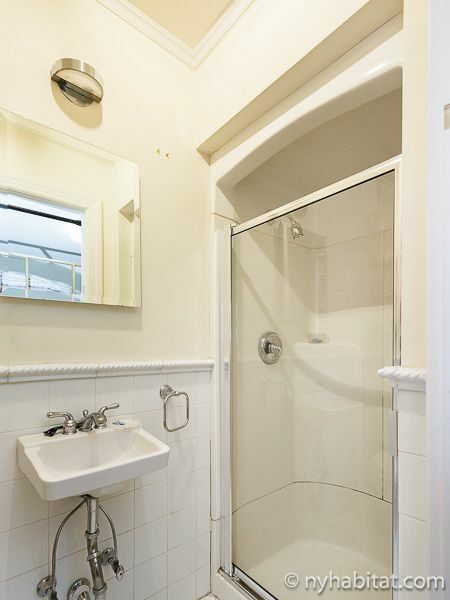 The bedroom and bathroom are private, and the living room and kitchen are shared with roommates. Bedroom 1 is your private room for rent. The room is furnished with a lofted twin-sized bed, opening the floor of the room up and creating extra space. 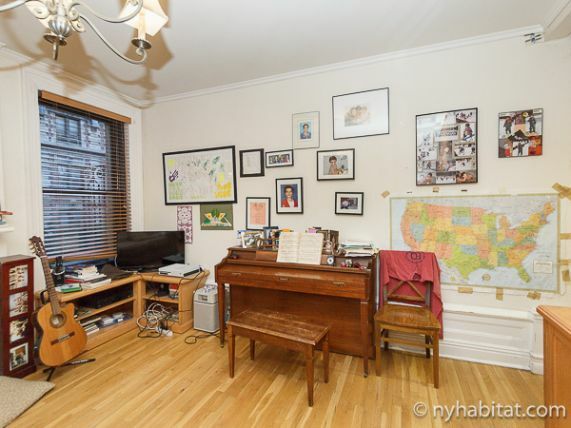 There are hardwood floors, an A/C unit, desk, dresser, and closet. 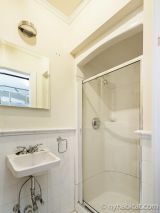 Your en-suite bathroom is equipped with a walk-in shower, WC, and towels supplied. The shared living room has a decorative fireplace, chandelier lighting, and is furnished with a sofa, piano, slat screen TV, and A/C unit. 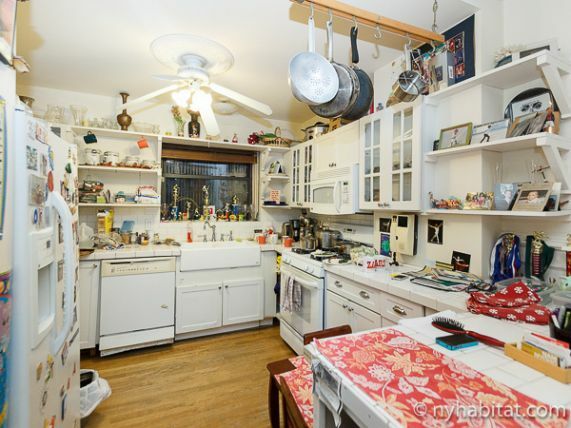 The shared kitchen has wraparound counter space, and is equipped with an oven, fridge, freezer, microwave, coffeemaker, toaster, and dishwasher. 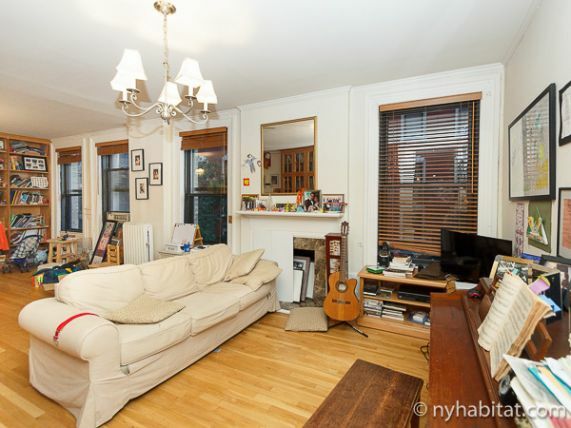 The Upper West Side of Manhattan is an upscale NYC neighborhood that is well known for its impeccable appearance, proximity to Central Park and Riverside Park, and its wide selection of dining options. Enjoy some Italian cuisine at Regional (0.2 mi/300 m), a neighborhood spot featuring a pasta-centric menu sourced from all over Italy in a setting decorated with subway tile and wine casks. Just at the end of your block you will find Riverside Park (262 ft/80 m), a scenic waterfront public park that offers residents access to a range of sports courts and fields, a skate park, a large portion of the Manhattan Waterfront Greenway (for bicycles), and the 110-slip public marina at 79th street. Have some fun at the Wang Chen Table Tennis Club (0.2 mi/350 m), run by the famous Olympian Wang Chen, the club offers personal table tennis instructors, and training for all ages and skill levels! The nearest subway at 96 Street / Broadway (0.2 mi/400 m) serves lines 1, 2, and 3.